Etihad Airways is the national airline carrier of United Arab Emirates (UAE) in the Middle East. Headquartered in Abu Dhabi, United Arab Emirates, the Middle East airlines has scheduled flight operations to the Middle East, Europe, Indian subcontinent, North America, Far East and Oceania. 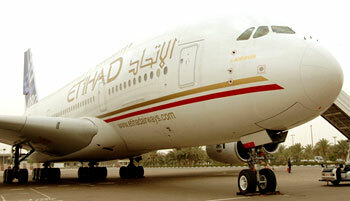 Etihad uses Abu Dhabi International Airport as its primary base and hub. 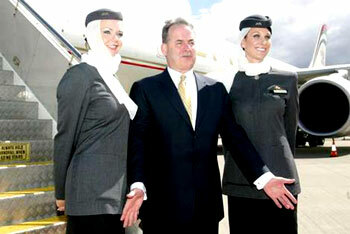 In 2006, Etihad has so far handles more than 3 million passengers and the airline company has 3200 employees. The cargo division for Etihad Airways is known as Etihad Crystal Cargo which started operations in September 2004. The cargo airline subsidiary operates its flight services using three Airbus A300-600F aircraft. Etihad Airways flies to 43 destination cities around the world as of November 2007. The airlines planned to expand its flight routes to 70 destinations by the year 2010. The list below displays all flight destination routes operated by Etihad Airways. In November 2003, an airline that change this new generation of thinking was established, Etihad Airways, the national airline of the United Arab Emirates. Born from Abu Dhabi, a city built on the spirit of change, Etihad is perfectly positioned to connect the four corners of the world. At Etihad Airways, we believe that nothing is impossible and continuely strive to drive the bar higher. We inspired by the power of human imagination. We embraced optimism and creativity. Our vision is to be a driving force of change in the aviation industry. We promised to celebrate this vision in everything we do. We believe in seeing things differently. We don't see passengers. We see guests. our guests could experience unparalleled hospitality rooted in our arabian heritage. Travelling the unique diamond, pearl or corals where our crew made up from 88 different nationalities and dedicated to our guests' every need. We don't see the present. We see the future. With the arrival of our new fleet, each aircraft is individually designed to deliver bold fast in aviation travel, realising our vision for more elegant flight experience, exceptional levels of comfort and plenty of space. Etihad is testing the boundaries of traditional airline design. we don't see borders. We see connections. we enable our guests to experience a different perspective, a fresh ultra commonwealth, by connecting people across the world with over 70 destinations planning to be on our route map by 2010. Etihad holidays offers an unparalleled range of packages to over 35 exciting destinations worldwide especially tailored to meet diverse individual needs. Our comprehensive range of cargo services to operate across the entire airline network. With a new regional freighter fleet, Etihad Crystal Cargo is committed to seeing every shipment as an individually investment and customer. We won't stand still. We will continue to grow, to challenge, to drive change and creativity within the aviation industry. Etihad Airways. Change the way you see the world. 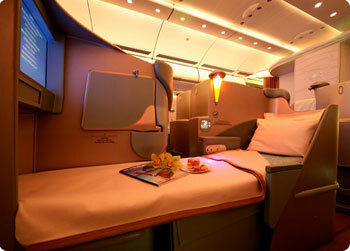 There are 3 cabin classes found in Etihad Airways. Diamond Zone is its First Class, Pearl Zone named for its business class and Coral Zone for the economy class. In all classes of travel, there are personal LCD screens mounted for passengers. Etihad Airways's in-flight entertainment includes an AVOD (audio-video on demand) system for use on all aircraft for its long-haul destinations. Another system in its entertainment feature is a Plug-And-Play powered by USB technology. This new system actually enables flight passengers to play their own audio and video media devices. Several other aircraft also features an in-flight telephony. Etihad Airways frequent flyer program is known as Etihad Guest which was officially launched in August 2006. This loyalty program has a discount web shop offered for its exclusive members to surf and shop. A merchant platform is also included easy management of products for its particpating merchants.